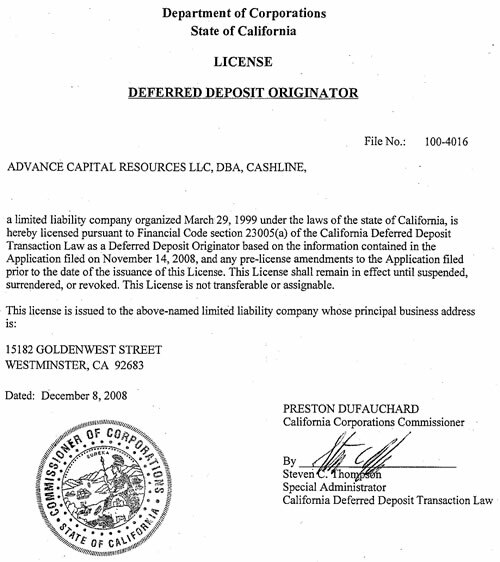 Cashline Loans is currently offering payday lending to residents of California only. We are NOT making loans to residents of any other state. California Fee Schedule for a 14 day term. California Fee Schedule for a 30 day term. Information about charges for deferred deposit transactions. That if the customer's check is returned unpaid, the customer may be charged an additional fee of up to fifteen dollars ($15). That the customer cannot be prosecuted in a criminal action in conjunction with a deferred deposit transaction for a returned check or be threatened with prosecution. The department's toll-free telephone number for receiving calls regarding customer complaints and concerns (1-866-275-2677). That the licensee may not accept any collateral in conjunction with a deferred deposit transaction. That the check is being negotiated as part of a deferred deposit transaction made pursuant to Section 23035 of the Financial Code and is not subject to the provisions of Section 1719 of the Civil Code. No customer may be required to pay treble damages if this check does not clear.